The first article in the series devoted to the Lent celebrations of Antigua, Guatemala introduced the Velaciones, honouring the Catholic icons within their church home. 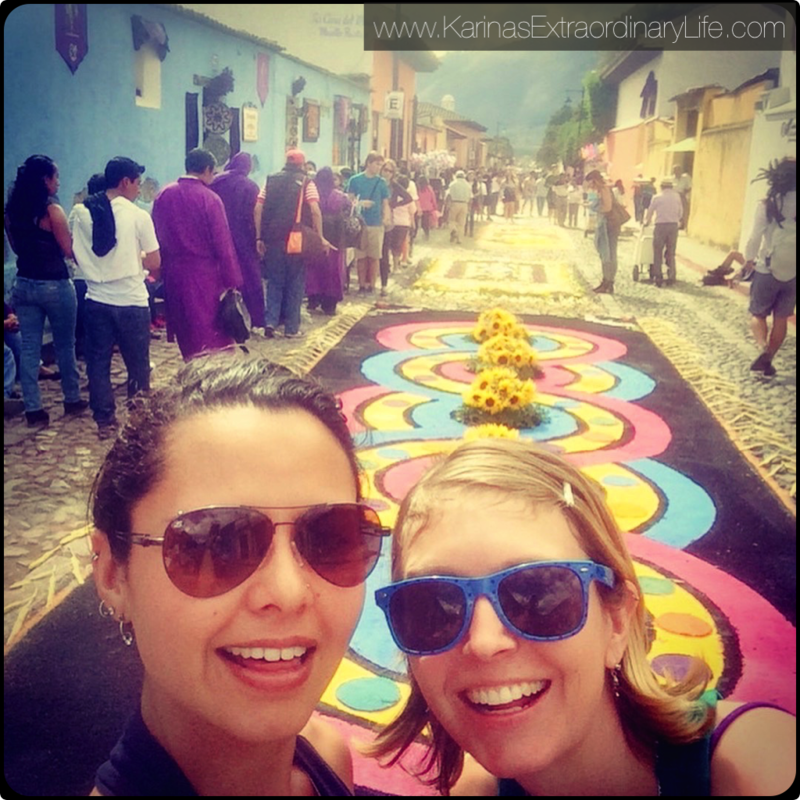 This week, I explored the concept of the alfombras or carpets created before each procession. 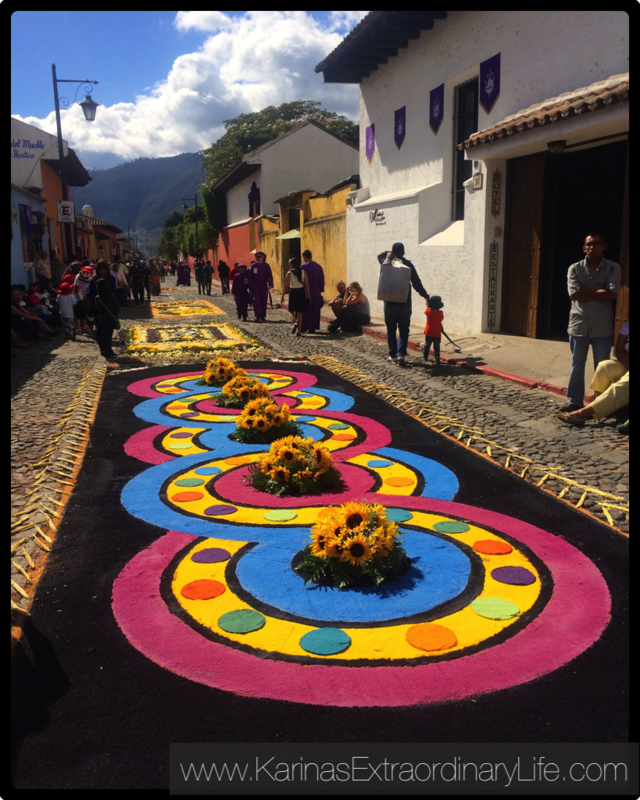 These elaborate but temporary works of art are some of the most beautiful displays that can be observed colonial Antigua and the surrounding towns on a weekly basis throughout the 6 weeks of Lent. I took to the streets to learn how the long-lasting tradition began and why it continues to be important for local people. 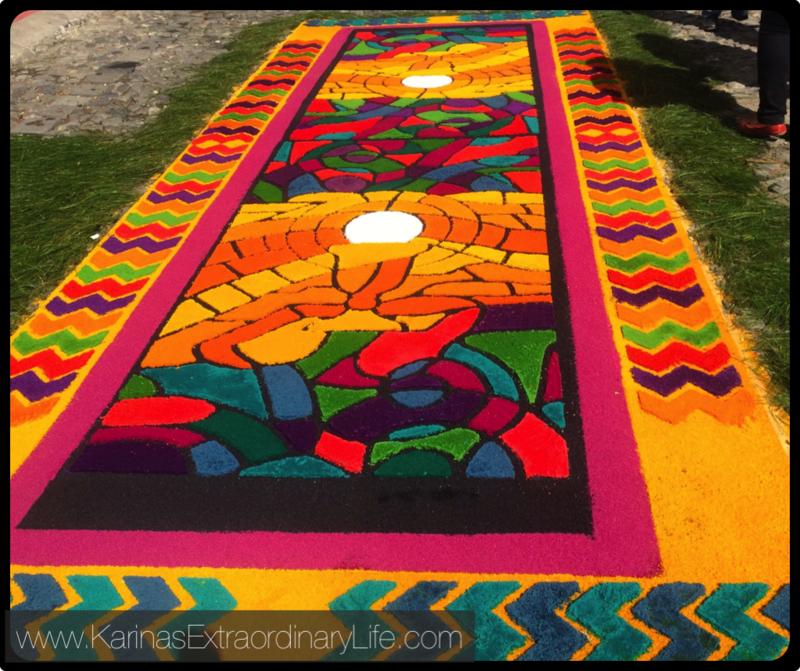 Alfombras are large hand-made carpets normally created out of brightly coloured sawdust, flowers and vegetation. When are alfombras the created? Alfombras are expressly created prior to the arrival of a procession. 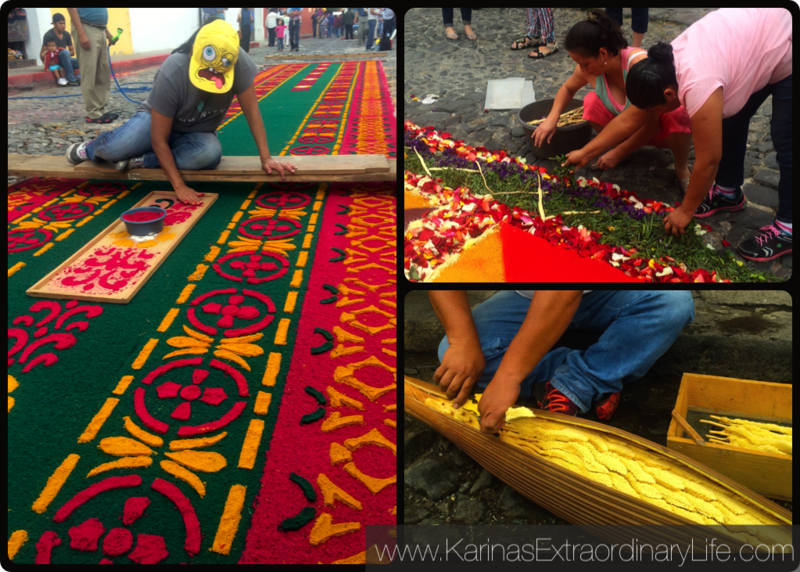 Depending on the hour the procession will pass, people may spend an entire sleepless night preparing the alfombra. The bearers of the procession’s andas (the massive display platforms) will then carry the image of Christ and the Virgin Mary over the alfombra, completely destroying it. Who makes each of the alfombras? Who covers the costs and labour? Families, neighbours and businesses who live in the path of a given procession traditionally come together to fund and make these spectacular displays. Members will divide the planning and labour. 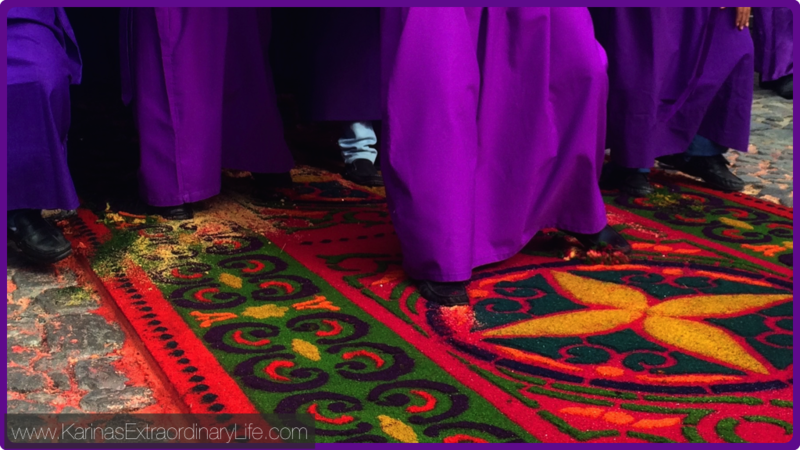 Some may volunteer to purchase particular materials for the alfomabra while others donate their time working extensive hours to complete their efforts before the dawn of the Cucuruchos (the penitent ones, dress in purple gowns). 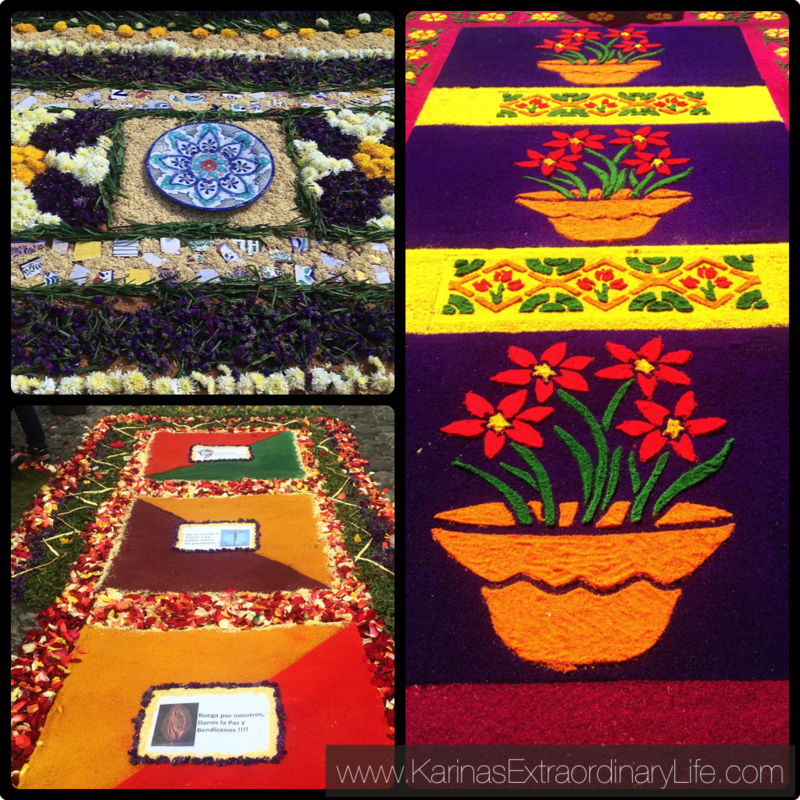 Given the hard work and expense of creating an alfombra, what is the personal value for partaking in this activity? Jose took a quick glance down at his emerging alfombra. He watched his kids and his wife melee around spreading rose petals and watering down the sawdust to keep it from blowing away. “It’s an offering. A way to give back to God and his son for the things He has given us”. How are the sawdust patterns created with such precision? Each group or family will spend considerable time carving a unique design on a board which then serves as the guide. On carpet making day, it’s just a matter of carefully following the colour scheme for the intricate patterns. Is this tradition as strong now as it was for previous generations? “Strong as ever.” Grace, a woman in her forties, assures me that the spirit of the people and their dedication to creation hasn’t faltered. “There are just as many alfombras now as their was when I was a child” Dora also draws from many fond memories, and in speaking with me, her excitement is contagious. For her, this tradition is about showing kindness and beauty. She is very proud and happy to share with me, as I am to be able to share with you.